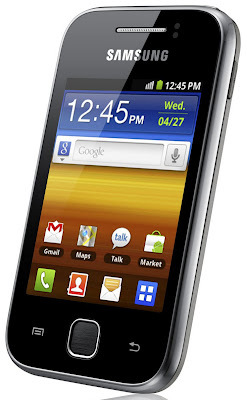 Gadget Of the year 2011 is Samsung Galaxy Y, Coolest Gadgest Of the Year 2011, Smartphone of the year 2011 is also Samsung Galaxy Y. Samsung's Latest and Stylish Smartphone is Samsung Galaxy Y. Samsung Galaxy Y Price in India - Rs. 6,700. It has Full Touchscreen and it works with a Android 2.3 (Gingerbread) OS. It is used to connect your buddies through Social Hub, E-Mail, Social Networking, Facebook, Twitter, etc., Its Dimension 104 x 58 x 11.5mm, Weight - 97.5g, It works with - 832 MHz Single-Core Processor, Display Resolution 320 x 240 pixels, 2.0MP Camera with the resolution of 1600 x 1200 pixels. In Built Memory 160 MB and its expandable up to 32 GB.